After 2 days of snow and strong winds we ventured out into the local Peak District hills for a walk from our home in Tunstead Milton. The snow had stopped but the wind was still gusting up to 30mph. We turned back after about 3/4 mile. The snow drifts were well over 6 feet high and effectively impassable to walkers. 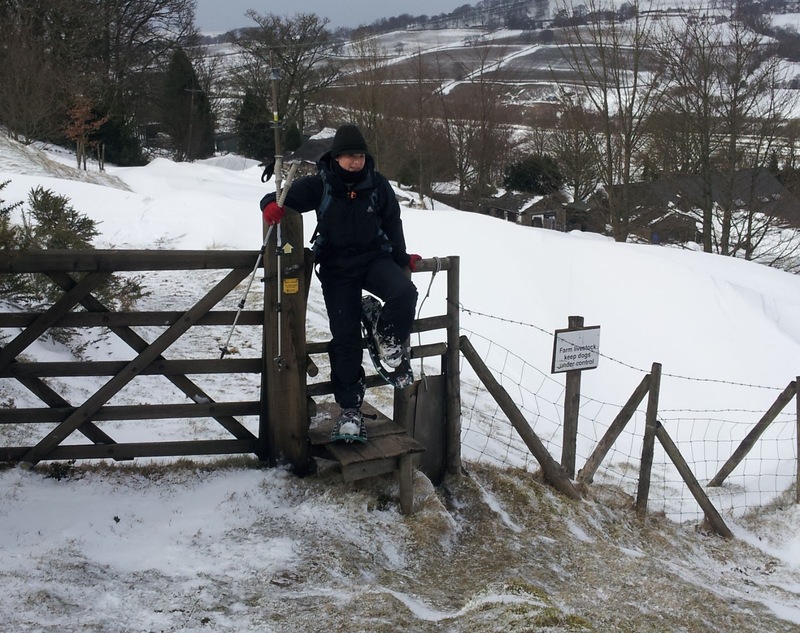 We returned home for our snowshoes, normally reserved for use in the Alps or Rockies and just a few occasions in the Peaks. Our snowshoes, MSR Lightning Ascents, were perfect for the conditions. 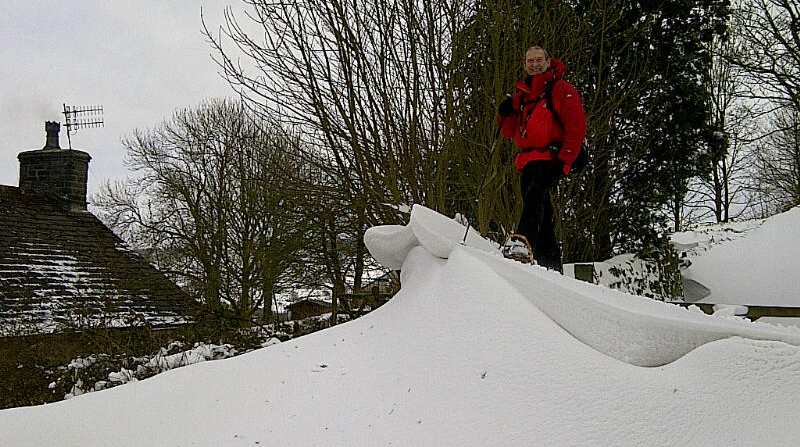 Quick to put on and light and stable, even when crossing 8 foot high drifts on the tops. The main difficulty was in negotiating the stiles! Taken by Dave Butcher on Samsung Galaxy S2 phone. The strange thing was the lack of snow on the fields but big drifts on the roads and tracks as well as near fences and walls. 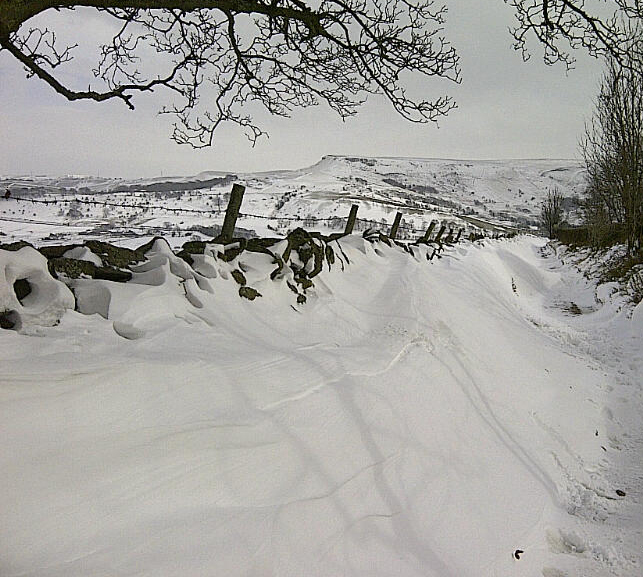 The back roads around Combs village, near Chapel-en-le-Frith, were all blocked by lots of big drifts. Taken by Jan Butcher on Blackberry Curve phone. In all we walked about 9 miles, it felt more like 15 because of the extra effort needed! I took a roll of Ilford FP4 120 film (10 negatives) with my Mamiya 7 camera and 65mm lens, all hand-held because I didn’t want to carry the weight of a tripod as my back was aching before we started. Had to be careful not to put anything too close to the lens as I couldn’t have much depth of field, I needed at least 1/60 sec exposure, with a dark yellow filter, to avoid camera shake. Tomorrow I should have been running a private landscape photography course but we have rescheduled for 3 weeks time. It will take a while to clear the side roads. 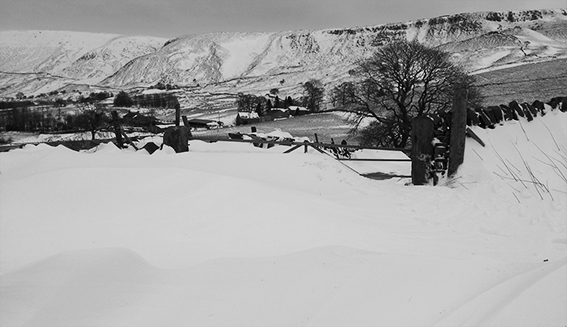 If you can get out in the hills it’s a good time for photos, especially black and white ones. Don’t plan to use any side roads though as they may well be blocked by snow, even the A6 was blocked into Buxton for part of today. More snow and cold temperatures are forecast for the rest of this week.